In my previous series of posts called “Kill the Hierarchy” I discussed the need for organisations to flatten the organisational structure if they are to survive in what is now described as a VUCA environment - volatile, uncertain, complex and ambiguous. Change is constant and unpredictable. Organisations have to be able to respond quickly to ever-changing conditions. Employees need autonomy and allowed to self-manage. In this series called ‘Let Go!’ I explore what I believe one of the biggest challenges facing organisations that wish to create this autonomous workplace. This is getting managers to let go. Managers need to become leaders and surrender control. 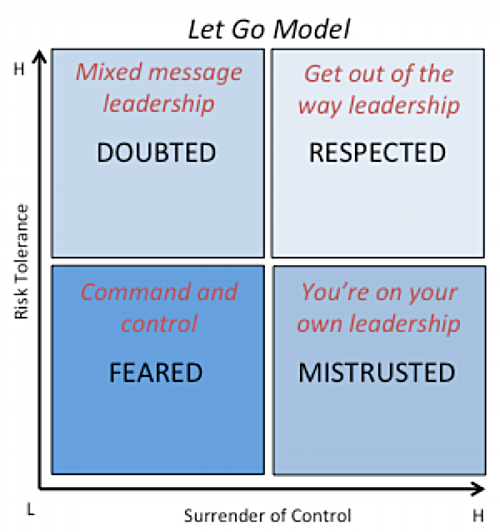 The ‘Let Go’ model shown the diagram below, illustrates that respected leadership comes when managers surrender control and are prepared to tolerate risks. When leaders retain control and are intolerant of risk, their management style is that of command-and-control. I should call them managers rather than leaders because managers manage tasks whilst leaders lead people. However for the purposes of this post, I will refer to ‘leaders’. Unfortunately we continue to associate the title ‘leader’ with those who rule with a forceful command-and-control style. Look no further than to Hitler as a perfect example of someone who led by fear – he was able to gain so much power by instilling such fear into his people that they had no choice but to comply. The attraction of being a feared leader is observant, compliant and obedient employees. This type of leadership might encourage employees to obey and follow the rules, but it will certainly not create a harmonious relationship between employee and leader. Feared leaders will not gain the trust of employees. Leadership through fear has no place in organisations today that want to survive. Effective leadership requires trust and respect. Command-and-control leadership uses policies, process and procedures accompanied by tight measures, to control the organisation. Measures could include hours in the office, number of calls answered, number of calls made, budget etc. It is authoritative with a top-down approach, which sits well in bureaucratic organisations with a hierarchical structure. Power sits at the top. Command-and-control stifles innovation, experimentation and creativity, all of which are needed when organisations have to stay ahead of the game. Whether that is commercial organisations remaining competitive or government agencies needing to rapidly respond to the demands of its citizens - command-and-control has no place. Fear is not a good motivator! Command-and–control uses extrinsic motivators including threats and authority. This will replace employee’s intrinsic motivation. When employees have autonomy and ownership of their work, they are engaged, motivated, and productive. There is increased collaboration and teamwork. Employees do not have respect for someone who assumes they know better than everyone else. Employees know a lot more about their area of expertise than their senior management. Despite the myriad of books and articles that have been written about the need to move from a command-and-control management style to a more people centred leadership approach, command-and-control still pervades many organisations. I believe that many leaders know what they need to do but it is the fear of losing control that stops them from doing it. Leaders have to relinquish control to others and trust employees to do the right thing. However, when in times of stress as a result of constant and unpredictable change, the natural tendency is to revert to behaviours that feel safe and less risky and therefore are more controlling. The other issue with command-and-control leadership approach is that employees will receive mixed messages. Survival in a VUCA world requires distributed decision-making, self-management, innovation, creativity, and experimentation in order for the organisation to rapidly response to marketplace and environmental changes. The problem is that whilst asking employees to act in this way but maintaining a command-and-control approach, not only constrains employees but also sends mixed messages. The leader is asking the employee to do something that they are not permitted to do! 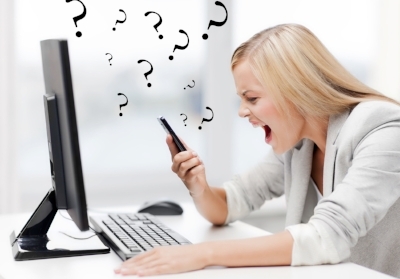 The result is disengaged and unmotivated employees. They will leave the organisation. The organisation will be unable to retain and attract the talent they need. Productivity will fall whilst attrition increases. In his book “12 Steps to Power Presence – How To Assert Your Authority to Lead”, John Baldoni says that it’s not enough to have a position of authority. A leader has to earn the trust and respect of followers. This is done through delegating decision-making and giving employees the opportunity to implement their own ideas. Leaders have to trust and let go. They need to earn the respect of their employees. There is no place for ‘my way or the highway’ anymore. Leaders may need help to move into this new world so organisations need to make sure that they get it. It’s not an investment they can avoid. Change is now constant and unpredictable. Organisations have to be able to respond quickly to ever-changing conditions. They need to create and innovate in order to not only survive but also thrive. This will only happen when employees have autonomy, can self-manage and are encouraged to make-decisions, innovate and experiment. Command-and-control leaders have to let go. Feared leaders have no place in the workforce today. The posts in this series will discuss each of the leadership styles in the “Let Go” model – feared, mistrusted, doubted and respected – and what leaders need to do to become respected. In the meantime, please subscribe to my newsletter so you have no fear of missing out!